Ann Arbor, Michigan – GMTA (German Machine Tools of America) represents various top-quality German metalworking machine builders, including Wera Profilator, K + G, Pittler, Praewema and WMZ, as well as Arnold lasers. These machines are sold to the North American market exclusively by GMTA, primarily for gear and spline production, as well as other power transmission and various metalworking applications. 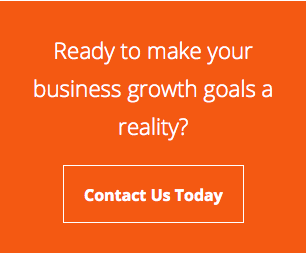 The company’s target markets include automotive, off-highway, energy and other heavy equipment manufacturing. Machines are provided for gear honing, gear grinding, the patented Scudding® process for gearmaking, polygon milling, turning, gear tooth pointing and multi-task machining operations, as well as various laser operations or laser line integration and parts washing. This newsletter is provided to our friends in the media to keep you and your readers updated on News of Note at GMTA. 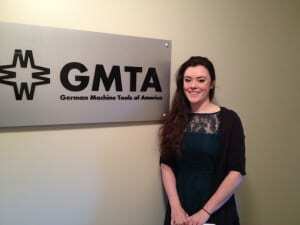 -GMTA continues their relationship with Eastern Michigan University (EMU), recently accepting Shannon Lynch, from the Masters in German and International Trade program, as an intern. Shannon’s mentor at GMTA and herself an MBA holder from EMU, the corporate treasurer Claudia Hambleton, remarked, “It’s the first time we’ve ever done anything like this. I feel really strongly about corporate responsibility for young people coming up into the industry…everybody needs experience, but how do you get it? I think this is a really good opportunity for Shannon.” The two shared several German classes at EMU, so the partnership was a natural fit. Shannon is responsible for assisting Claudia with daily office duties including receiving, invoices and translations, in communications with the company’s German partner firms. During her internship, Shannon has also had the opportunity to engage in industry-related educational and technical sessions such as the Economic Forum of the German American Chamber of Commerce, an Advanced Excel Workshop for data analysis and the recent North American International Auto Show Charity Preview, a very prestigious event and a great networking opportunity for the leaders in automotive manufacturing. -GMTA participated in the annual Auto Show Charity Preview in Detroit and a good time was had by all. -GMTA is running at “light speed” with their new Arnold laser work cells. Available as single or double work cells, the Arnold systems are offered as CO2 or fiber lasers, with full integration into a machining line, either by means of robotic part articulation or other automated transfer mechanisms, most of which are being supplied to customers by GMTA engineering. Leads from IMTS and the company’s aggressive ad program are already being developed into serious opportunities for the company, often in tandem with other machine tool lines and the Rosink parts washers now offered by GMTA. -Recently, a Diskus vertical double-disc grinder was sold to Hoergiger Fine Stamping in Canada. The DDS 600 machine feature two vertically arranged motor spindles, each equipped with 600mm grinding wheels used for simultaneous two-sided grinding of shims. The machine has a rotary through-feed system and an integral post-process measuring system, all developed by Diskus engineering and provided to the customer by the GMTA teams from Ann Arbor. -The Mexico office of GMTA is reporting brisk activity, owing to the substantial procurement authority in-country now. According to VP Scott Knoy, “This contrasts with bygone days, when the decision-making and purchasing were largely centered in America and specifically in Detroit. It’s a whole new ballgame with the Mexican market today and we believe our new location (Queretaro) there is well positioned to serve this dynamic manufacturing environment.” GMTA already has a substantial installed base of machines in Mexico from all their partner companies. -The alliance with Star, through which GMTA is sourcing tooling locally, continues to prosper and mutually benefit both companies. -GMTA was featured prominently in a recent article in Manufacturing Engineering magazine, covering the subject of gear making for the energy sector. 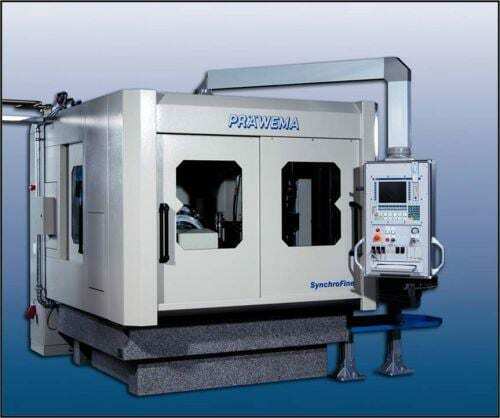 -Now available from GMTA, the Präwema SynchroFine 205 HS gear honing machine features direct-driven, digitally controlled spindles for the tool and the workpiece, enabling precise, rigid synchronization. The Präwema Honing gear finishing process produces quality comparable to grinding results for spur and helical gears, as well as shafts. The machine’s software checks the stock allowance and workpiece runout and then optimizes the X-axis approach distance. Measuring the workpiece does not affect the cycle time and the process can reduce overall cycle times by 3 to 5 sec.